Name: "Portrait of Doge Leonardo Loredan"
A celebrated example of Venetian portrait painting, Giovanni Bellini's official Portrait of Doge Leonardo Loredan (1436-1521) depicts the powerful but irritable chief magistrate and leader of Venice, who ruled the city and its Republic from 1501 to 1521. He is shown wearing his official hat - a corno ducale worn over a linen cap - and his ceremonial silk robe complete with ornate buttons. The Latin version of Bellini's name (IOANNES BELLINVS) is written on the illusionistic piece of paper which is painted on the balustrade running across the foot of the painting. Inspired partly by the Netherlandish Renaissance, and partly by the dignified portrait busts of Ancient Rome, the picture exemplifies the sumptuous, colouristic and aristocratic nature of Venetian painting - a style derived from the Byzantine art of Constantinople, Venice's chief trading partner - of which Bellini was the leading exponent. See also his Ecstasy of St Francis (1480) and his San Zaccaria Altarpiece (1505). The Bellini family as a whole was distinguished by its creativity. Giovanni's father was the painter Jacopo Bellini (1400-1470), while his elder brother was the portraitist Gentile Bellini (1429-1507), and his brother-in-law was Andrea Mantegna (1430-1506). Giovanni also taught Titian and Giorgione, who would become two of Venice's greatest artists. NOTE: For more about the differences between Venetian art and the Florentine Renaissance, see: Colorito versus Disegno. Whe this portrait was painted, Venice was almost certainly the richest city in the world, and - with 180,000 inhabitants - the second largest city in Europe after Paris. The territory of the Republic of Venice covered some 27,000 square miles and had over 2 million inhabitants. 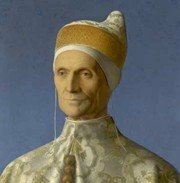 The Venetian ruler, the Doge, was therefore a very important man, and - unfortunately for Bellini - was somewhat prickly and impatient. Perhaps because of this, Bellini opted not to focus on the personal characteristics of the sitter, but rather on the power of the Doge as an institution. He does this in three ways. First, Bellini pays meticulous attention to the Doge's ceremonial outfit, especially the gold-threaded damask and patternwork of his brocaded silk jacket. His hat and buttons are also reproduced with great fidelity. His skill in rendering the differing fabrics undoubtedly stemmed from his knowledge of Flemish painting, whose exponents - like Jan van Eyck - were the acknowledged leaders in realist painting. Second, he gives the Doge a classical, assured pose, which lends him the sort of gravitas often seen in Roman Emperors and the like. His face is strikingly lifelike, and Bellini turns it towards the light, allowing us to see subtle traces of stubble as well as a range of facial wrinkles. (These details are also brought to life by the artist's use of thin transparent layers of paint on the face, rather than the thick layers used on the clothing.) Third, so as to compel us to focus on the sitter, Bellini eliminates any depth in the portrait by creating a flattened backdrop filled with a deep blue. In this way, he turns an irritable 65-year old Venetian politician into a solid symbol of Venetian power and authority. This is subtly reinforced by Bellini's use of light. The angle, nature and colour of the light shining on the Doge's face suggests that the sun is low in the sky (but far from setting), hinting at a time of late afternoon or early evening. This indication of passing time, along with the age of Loredan's face, may be a reference to the symbolic comparison between the duration of a day and the natural span of a human life. The point being, that the Doge still has a good amount of life left in him. A conclusion which would have been reassuring to the city of Venice as well as the sitter. In all, the work is one of the greatest Renaissance portraits of the sixteenth century. Note: For more about 16th century art in Venice, please see: Venetian Drawing (1500-1600) and Venetian Altarpieces (1500-1600).  Lady with an Ermine (1490) Czartoryski Museum, Krakow.  Mona Lisa (La Gioconda) (1503-06) Louvre, Paris.  Portrait of Baldassare Castiglione (1514-15) Louvre, Paris.  Pope Leo X with Cardinals (1518) Galleria Palatina, Pitti Palace, Florence.  For the meaning of other Renaissance paintings, see: Homepage.